01. The Chairman, Department Procurement Committee, on behalf of the South Eastern University of Sri Lanka invites sealed bids from eligible and qualified bidders for the following works. 03. To be eligible for contract award, the successful bidder shall not have been blacklisted and shall be registered in the field of Highway / Building with the Institute for Construction Industry and Development Authority (CIDA) as indicated in the above table. 04. Bids shall be accompanied by a Bid Security as per the information given in the above table. 06. A complete set of Bidding Documents in English language may be purchased by interested bidders on the submission of a written application to the Deputy Registrar / Capital Works & Planning South Eastern University of Sri Lanka, Oluvil. from 08.03.2019 until 21.03.2019 from 9:00 a.m. to 03:00 p.m. upon payment of a non refundable fee of Rupees Five Thousand (5,000/-) for each bid. 07. Bids shall be deposited in the tender box kept in the office of the Registrar or sent by registered post to the Chairman, Department Procurement Committee of South Eastern University of Sri Lanka, Oluvil to reach him before 02.30 p.m. on the 28.03.2019. Bids will be opened immediately thereafter in the Board Room of the South Eastern University of Sri Lanka, Oluvil in the presence of the bidders' representatives who choose to attend. 08. Bids shall be valid for a period of 90 days from the date fixed for closing of Bids or any extended period. In the form included in section 09 in the Bidding document. For the amount as indicated in the above table. In favour of "Vice Chancellor, South Eastern University of Sri Lanka, Oluvil". Issued by one of the agencies indicated in the clause 16 of ITB of the schedule. 10. 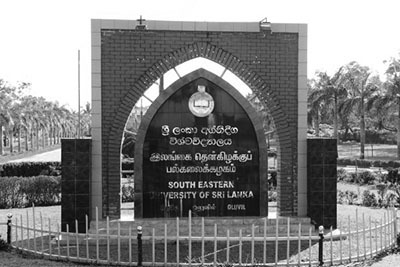 A Pre Bid meeting will be held at the Board Room of the South Eastern University of Sri Lanka, Oluvil on 26.03.2019 at 11.00 a.m. for the above works.